Windows XP comes with three security settings, Firewall, Automatic Updates, and Virus Protection, and each protects you from something different. You need to use all three of these defenses for maximum safety in Windows. Choose Security Center from the Start menu’s Control Panel area to make sure your computer’s defenses are up and running. It lists the status of your firewall, automatic updates, and virus protection. Click any of the icons in Internet Options, Automatic Updates, and Windows Firewall to adjust their settings. 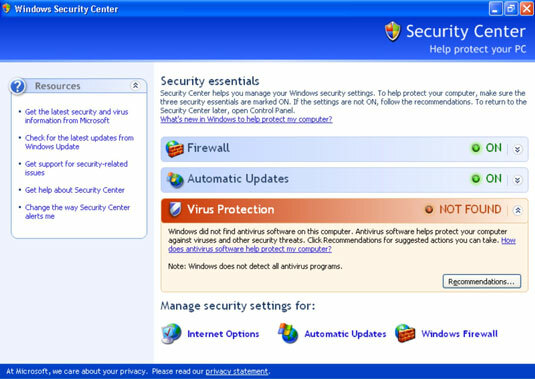 The Security Center shown here indicates that the computer needs a virus checker or that the current one isn’t working properly. Click the Recommendations button for tips on correcting the problem.